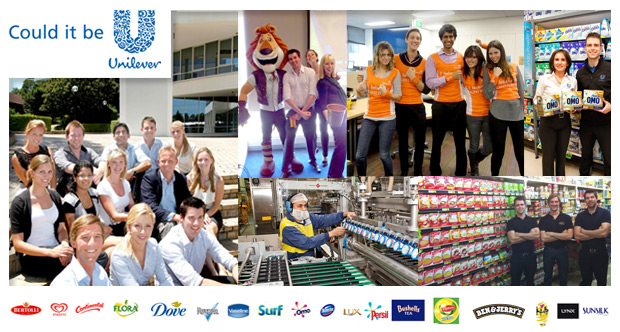 Unilever is the global company behind powerhouse brands such as Dove, Lipton, Lynx, Streets and Surf. Everyday, Unilever products touch the lives of over 2 billion people across 190 countries. We are committed to helping people feel good, look good and get more out of life through brands and services. That’s what makes us one of the largest, most successful suppliers of fast moving consumer goods on the planet. Our business is not just about selling products. Last year we contributed $120 million to communities around the world. We’re doing well by doing good. We’ve achieved our success with uncompromising honesty, strong environmental ethics, intuitive insights, respect for people and stringent standards at a global, local and community level. Keeping the world’s best loved brands out in front takes talent, drive and fresh thinking. Ultimately, it’s our 171,000 employees who will help us answer the question: ‘What do we want to do now and in the future?’ We don’t ask our people to simply join our business. We ask them to become our business, driving it forward as if it were their own. We’ve always focused on doing the right thing, believing our brands can improve the quality of people’s lives. As our business grows, so do our responsibilities. We have the huge ambition of doubling in size, whilst halving our environmental impact, and to achieve this, we need new ideas that will fundamentally change how business works. By 2020 we will also help more than 1 billion people take action to improve their health and well- being, and source 100% of our agricultural raw materials sustainably. To do this, we have launched the Unilever Sustainable Living Plan which details 50 solid targets that will inspire billions of people to take small, everyday actions that make a big difference. Our community involvement is focused around the areas of nutrition, hygiene and sustainability. Unilever aims to make a real difference by encouraging our employees to take initiative and help others through various projects in the community.